In the face of the brutal crime committed on March 22nd against a coordinator of the Movement of Dam-Affected Peoples in Brazil, the undersigned human rights and environmental organizations call on Brazilian authorities and multilateral organizations to ensure that the country's provisions regarding the protection of human rights and environmental defenders are enforced. 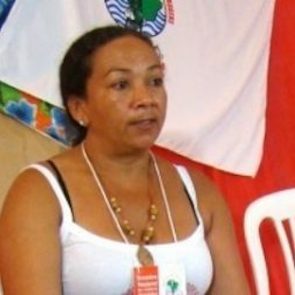 With deep sadness and indignation, we received the news that Dilma Ferreira Silva, a regional coordinator of Brazil's Movement of Dam-Affected Peoples (MAB), together with her husband Claudionor Costa da Silva and Hilton Lopes, a friend of the family, were assassinated on Friday, March 22nd in the Amazonian state of Pará. The bodies of the three victims were found in her residence with signs of torture. Dilma Ferreira Silva was a prominent activist and recognized leader who, for more than three decades, fought for the rights of the people affected by the Tucuruí mega-hydroelectric dam project on the Tocantins River of the Brazilian Amazon, built during the country's military dictatorship 1964 -1985), provoking the displacement of an estimated 32,000 people, along with serious environmental damage. This is not the first case of the brutal murder perpetrated against human rights defend in the region of the Tucurui dam. In April 2009, Raimundo Nonato do Carmo, a union leader who fought on behalf of those whose lives were ruined by the Tucuruí was shot seven times by two men on a motorcycle as he walked out of the supermarket on the street in which he lived in the town of Tucuruí. Dilma Ferreira lived in the rural settlement of Salvador Allende, where land titles were issued for family farmers by the federal government in 2012, as a result of a popular mobilization of the Movement of the Landless Workers (MST), with support from MAB. However, the area continued to be coveted by land grabbers that invade and seize control of public and community lands. One such example is Fernando Ferreira Rosa Filho (aka 'Fernandinho') arrested by the civil police force of the state of Pará as the main suspect in the triple homicide of Dilma Ferreira, Claudionor Costa da Silva and Hilton Lopes. The incoming administration of President Jair Bolsonaro has intensified recent attempts to undermine Brazil's progressive legislation on environmental protection and human rights - especially those of indigenous peoples, quilombolas (descendants of African slaves), family farmers and other traditional populations. Such attempts have often clashed with Brazil's progressive Federal Constitution, approved in 1988 during a period of redemocratization that followed military rule. Backsliding on public policies, together with public statements that incite violence in conflictive areas, are seriously increasing the risks faced by human rights and environmental defenders such as Dilma Ferreira Silva. We stand with the UN High Commissioner on Human Rights in demanding a complete, independent and impartial investigation of the murder of Dilma Ferreira Silva, as well as the exemplary punishment of those who carried out and ordered this horrendous crime. Moreover, we call on Brazilian authorities to ensure that the country's domestic legislation and international obligations are respected, including preventative action to avoid further acts of violence.